Gram staining method, the most important procedure in Microbiology, was developed by Danish physician Hans Christian Gram in 1884. Gram staining is still the cornerstone of bacterial identification and taxonomic division. Fixation of clinical materials to the surface of the microscope slide either by heating or by using methanol. (# Methanol fixation preserves the morphology of host cells, as well as bacteria, and is especially useful for examining bloody specimen material). Application of mordant: The iodine solution (mordant) is added to form a crystal violet iodine (CV-I) complex; all cells continue to appear blue. Decolorization step: The decolorization step distinguishes gram-positive from gram-negative cells. The organic solvent such as acetone or ethanol, extracts the blue dye complex from the lipid-rich, thin walled gram negative bacteria to a greater degree than from the lipid poor, thick walled, gram-positive bacteria. The gram negative bacteria appear colorless and gram positive bacteria remain blue. 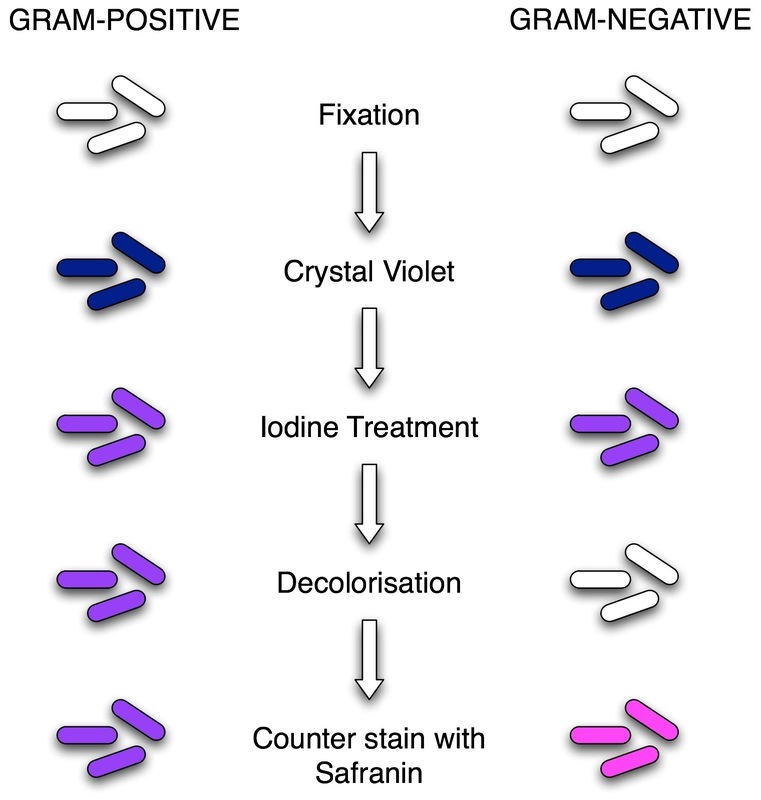 Application of counterstain (safranin): The red dye safranin stains the decolorized gram-negative cells red/pink; the gram-positive bacteria remain blue. 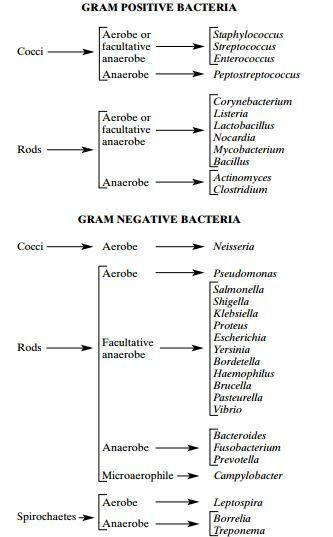 The differences in cell wall composition of Gram positive and Gram negative bacteria accounts for the Gram staining differences. Gram positive cell wall contain thick layer of peptidoglycan with numerous teichoic acid cross linking which resists the decolorization. In aqueous solutions crystal violet dissociates into CV+ and Cl – ions that penetrate through the wall and membrane of both Gram-positive and Gram-negative cells. The CV+ interacts with negatively charged components of bacterial cells, staining the cells purple. 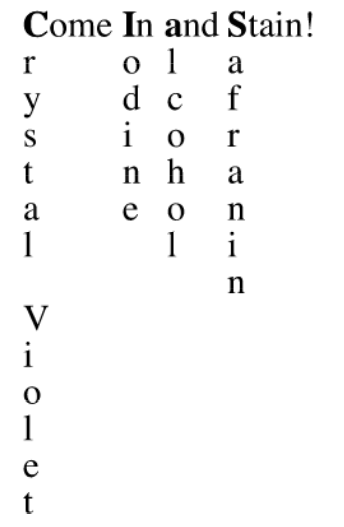 When added, iodine (I- or I3-) interacts with CV+ to form large crystal violet iodine (CV-I) complexes within the cytoplasm and outer layers of the cell. The decolorizing agent, (ethanol or an ethanol and acetone solution), interacts with the lipids of the membranes of both gram-positive and gram negative bacteria. The outer membrane of the Gram-negative cell (lipopolysaccharide layer) is lost from the cell, leaving the peptidoglycan layer exposed. 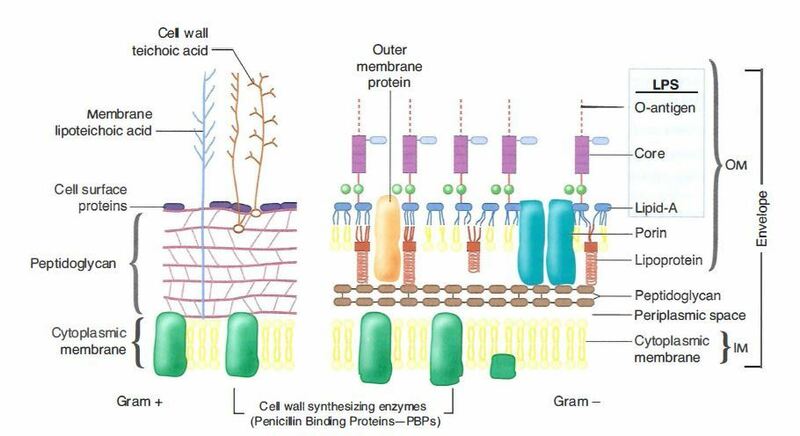 Gram-negative cells have thin layers of peptidoglycan, one to three layers deep with a slightly different structure than the peptidoglycan of gram-positive cells. With ethanol treatment, gram-negative cell walls become leaky and allow the large CV-I complexes to be washed from the cell. The highly cross-linked and multi-layered peptidoglycan of the gram-positive cell is dehydrated by the addition of ethanol. The multi-layered nature of the peptidoglycan along with the dehydration from the ethanol treatment traps the large CV-I complexes within the cell. 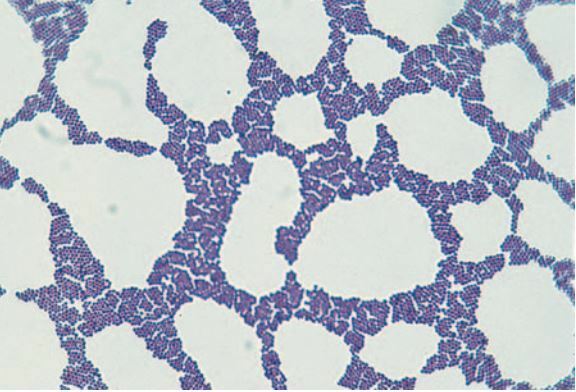 After decolorization, the gram-positive cell remains purple in color, whereas the gram-negative cell loses the purple color and is only revealed when the counterstain, the positively charged dye safranin, is added. Fix material on slide with methanol or heat. If slide is heat fixed, allow it to cool to the touch before applying stain. Flood air-dried, heat-fixed smear of cells for 1 minute with crystal violet staining reagent. Please note that the quality of the smear (too heavy or too light cell concentration) will affect the Gram Stain results. Wash slide in a gentle and indirect stream of tap water for 2 seconds. Flood slide with the mordant: Gram’s iodine. Wait 1 minute. Flood slide with decolorizing agent (Acetone-alcohol decolorizer). Wait 10-15 seconds or add drop by drop to slide until decolorizing agent running from the slide runs clear . Flood slide with counterstain, safranin. Wait 30 seconds to 1 minute. Wash slide in a gentile and indirect stream of tap water until no color appears in the effluent and then blot dry with absorbent paper. Observe the results of the staining procedure under oil immersion (100x) using a Bright field microscope. If you are struggling to remember the staining reagents used in this procedure and their order you can remember this sentence “Come In And Stain” i.e. the order is Crystal violet, Iodine, Alcohol/Acetone and the final one is Safranin. Gram-positive bacteria will stain blue/purple. Morphology of the bacteria, whether cocci, diplococci, streptococci, rods, or coccobacilli. Also, whether the organisms are intracellular. Presence of yeast cells and epithelial cells. Quality Control: Always check new batches of stain and reagents for correct staining reactions using a smear containing known Gram positive and Gram negative organisms. Various factors influence the results of Gram staining. Sometime the result might be entirely different than you have anticipated. Find out about ‘variations in Gram Staining Results in this post’. The Note Given Is So Good!But Would You Mind Giving Additional Notes About Bacterial Growth And Its Classification? sir plz mention the objectives and procedures step by step,which i can apply it during examinations …. very good notes. but Is there any other references concerning gram staining? Nice explanation of gram staining procedure. Can you provide the process for test of protein in urine 24 hr. A blood culture was performed with a gram stain. The gram stain was reported out the following day as “Light gram positive cocci”. Two days later, the culture was reported as “Heavy e-coil. Can gram positive cocci become gram negative rods? No, it wont. Possible explanation may be, there is contamination with Gram positive cocci (CONS) and E.coli is the causative agent. But they gave you result within 24 hours that sound’s strange too. Personally I dislike the use of acetone/alcohol in the decolourisation step. I much prefer 70% ethanol. The use of acetone, I believe, is too aggressive and means that timing becomes an issue. This was also an issue for me with the Brown/Brenn modification that had a vogue in the 1960s. I may, of course, be a little rusty as I last worked full-time in microbiology in 1970 (I was at the Central Veterinary Laboratory of the UK Ministry of Agriculture Fisheries and Food). I have since taught elements of microbiology at secondary and tertiary level. sir,thank u for given this notes.i want clear details in every organisms.